You’ll be aware that there have been many legal challenges against Workfare/The Work Programme/Mandatory Work Activity, on the basis that they are slave labour schemes. The Department for Work and Pensions, under slave-master Iain Duncan Smith, has worked tirelessly to dismiss these challenges – with only limited success, as our courts are populated by judges who still believe in something called justice. 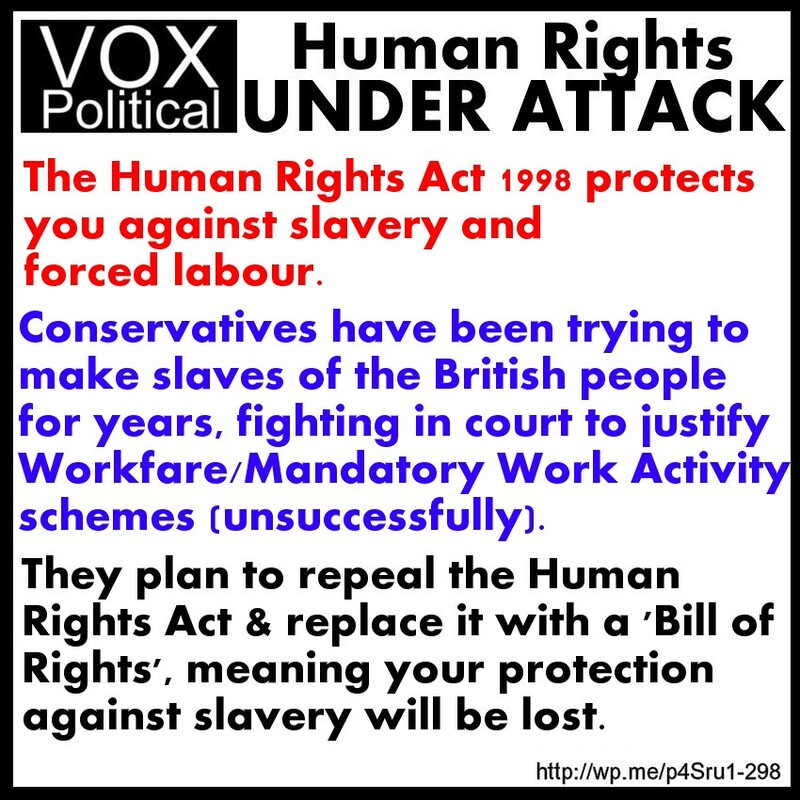 However, the repeal of the Human Rights Act 1998 means the end of the ban on slavery. Conservatives are already making plans to force any young person without a job to work for 30 hours a week in exchange for benefits – or starve. Do you think that’s acceptable? Would you accept it if they did it to you? I enjoy your stuff, but your current method of presentation is crowding my inbox horribly. Could you try putting out composite posts containing links to each thing that you consider important? I’ve been pressed for time lately, otherwise I’d probably have been writing more full articles on some of these subjects myself; the decision was that it’s better to get them out in whatever form I can. It will ease off soon, I expect. I would agree with it ONLY providing that the work was within a reasonable distance of the young person’s area and was not an uncongenial type of work. There are no valid arguments for workfare. There are even fewer for paying an adult £50 for all their needs, which is obviously too little, and then expecting them to pay for travel & employment costs – like food, clean clothes etc – out of that too.